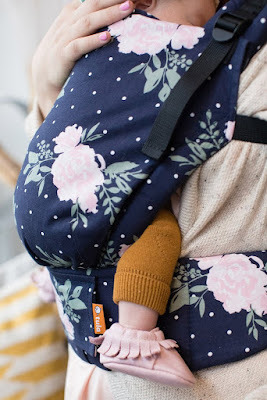 Love, Mrs. Mommy: Tula Free to Grow Baby Carrier Giveaway! Tula Free to Grow Baby Carrier Giveaway! This awesome giveaway is open to both US and Canada entrants! Best of luck to all! Tula Baby Carriers have become extremely popular with parents world wide. They have an amazing product that makes baby carrying easy! A group of bloggers have joined together to bring you the chance to win one of these gorgeous Baby Carriers. ‘Blossom’ symbolizes the quickly growing and delicate beauty of a tiny baby. Bouquets of soft pink flowers are displayed amongst sprinkled dots on a navy background covering the entire front of the carrier and detachable hood. The inside lining is solid navy blue. What makes FREE-TO-GROW BABY CARRIER a great choice? Now for the best part! One lucky winner will have the chance to win one of these gorgeous Tula Free to Grow Baby Carriers in Blossom print. To enter head below! Giveaway is open to US & CAN and ends on 10/1 at 11:59pm . Must be 18+ to enter! Good luck! I really like the extra padding on the legs that seems very comfortable for the baby.